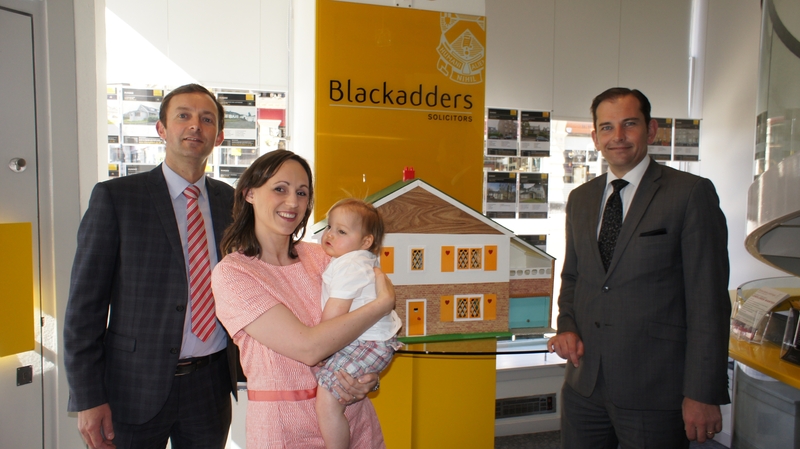 A beautifully crafted detached dolls’ house is being auction off with the help of the Blackadders property team and Curr & Dewar auctioneers, to raise funds for the The Blake McMillan Trust. Blake McMillan was diagnosed with MeCP2 Duplications Syndrome shortly after his birth. It is a cruel and debilitating condition which will mean Blake will probably be unable to walk or talk. From left to right: Steven Dewar, Jenny McMillan, Blake McMillan and Lindsay Darroch. The Dolls’ house is currently displayed in the Blackadders property shop, Whitehall Street, Dundee and the property team will be take bids until the 22nd August. The house will be then be moved to Curr and Dewar and it will go under the hammer on the 26th August. For more information please visit The Blake McMillan Trust Facebook page. You can view the doll’s house here on the Blackadders website.